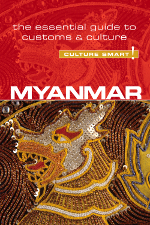 Kyi Kyi May was born and brought up Myanmar, where she attended Rangoon Arts and Science University and gained a M.Sc. in Zoology. She became a print journalist before joining the BBC Burmese Service in London as a producer and gained a BA (Hons) degree in Politics, Philosophy and History at Birkbeck College, University of London. As a BBC producer, a field reporter, and later as head of the Burmese Service, she has written and broadcast many current affairs and feature programs for Burmese listeners of all ages.